Camouflage and neon? How East London of me! Hahah, I don't know. I don't think I'd ever normally wear these two together, I don't even know why I thought it would be a good idea. But much to my surprise I did actually really like the two together! Although I can see it as being a tad controversial. I saw this cardigan on the Topshop website when I was away and decided to purchase it so it was there when I got back. I don't rate Topshop knitwear but I really do like the feeling of this cardigan and love the thickness. God knows what it will look like when I wash it, so Im definitely keeping my receipt! I don't actually own a single cardigan at the moment and I really do need to change that ASAP with the way the weather is here at the moment. Today I've been about London picking up a few things including a sample of the new YSL foundation that I've been DYING to try! Now Im back in the safety and warmth of my own house. This evening I'm tackling the mess that is my bedroom and taking my holiday laundry to the laundrette. Then I'm going to have an epic post holiday pamper session and eat some cupcakes! My skin has broken out a lot around my mouth because of my (mild) lactose intolerance paired inability to avoid anything cheese while on holiday! I've recently bought some new REN Skincare and a full size Philip Kingsley Elasticizer. Which I hope will sort out my horrifically dry post holiday hair! Ahhh, I've needed a leather/"leather" jacket for too long - every time I see one, the craving comes back! 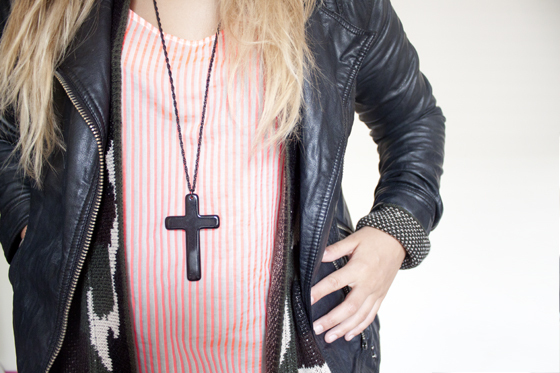 Also love the colour of your stripy top against the black cross necklace - love contrast. You look gorgeous, your face is perfection! Love the leggings, their beautiful! Really like this outfit, the cardigan looks great with the stripy dress! I love this look! It's something completely fresh and different! The cardigan is fab. Love this look! The camo and neon shouldn't work together in theory but here they do! I don't really rate TopShop knitwear too, it's too expensive and often the quality is really shoddy. Loving my flea market knit wear finds so much more. I'd love to hear what you have to say about the YSL foundation and if it's worth the investment. I'm still on the hunt for the perfect foundation. ah you look so cute and tanned! Really love what you are wearing right now! This outfit is SO perfect! I really like the neon pop! 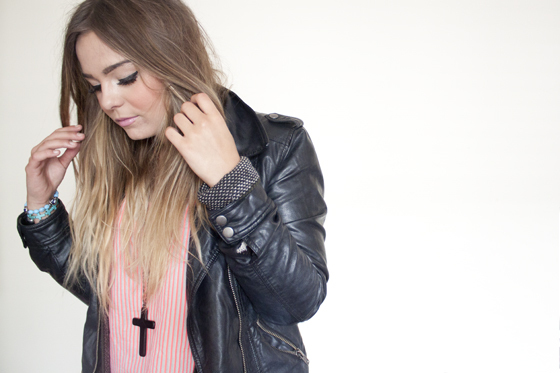 I think you've persuaded me to get my first leather jacket, your outfits with them always look so lovely! You big hipster! I actually really love this style on you! The cardigan looks so snuggly! Love the cardigan! Great outfit. 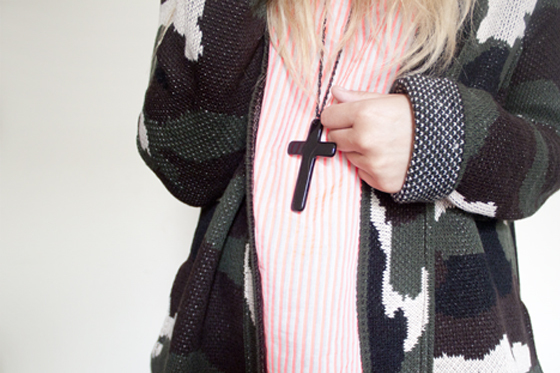 Love the mix of camouflage print and neon, although I have to agree with you, Topshop's knitwear is a big no-no. It holds even worse than Primark's knitwear after a few washes! I really like your bracelets! I love this cardigan, I'm definitely going to have to grab it when it comes into my store! I am obsessed with your camouflage cardigan! Almost got that cardi while I was in London but wasn't sure how to style it. Now I wish I had picked it up! I love your bracelets, they're all so pretty! The cardigan looks good with the neon, I really like it. seriously want that cardi, it looks amazing! OMG. THE CARDIGAN. TRUE LOVE <3 ! loving the mix of prints and textures! I love your outfit! 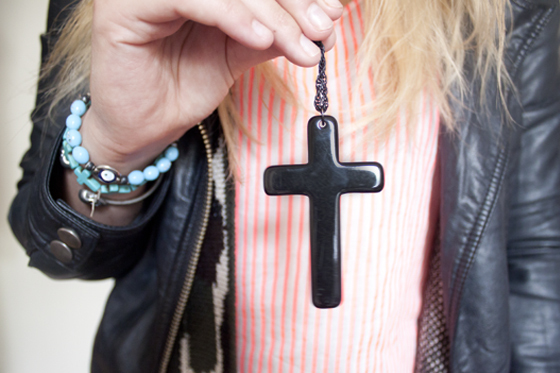 You accessorize so well! And you have the prettiest hair! Lovely. Aaah the cardigan is awesome! 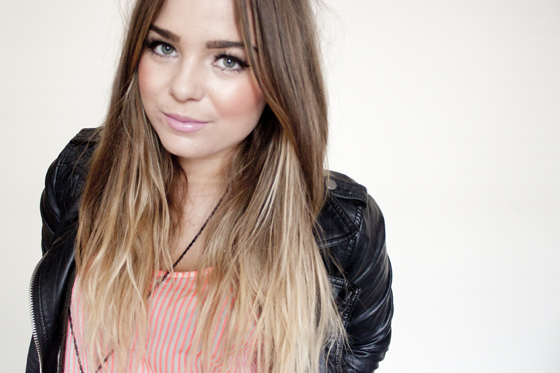 Your hair looks great in these pictures - not that it ever looks anything less than that! I'm going to eat cupcakes too. Really love that cardigan! You look lovely as ever! I know what you mean about Topshop knitwear. I always find that Topshop do really nice styles and patterns, but they don't seem to hold up well in the wash....In fact most of my Primark stuff seems to last longer! I do love this cardigan though, looks really cosy!! really love your leather jacket! really want a new one! love the jacket and cardi. your make up looks gorgeous!